Combine the good feelings that come with an old fashioned family reunion, on the beautiful Southeast Texas Gulf Coast, the celebration of Mother’s Day Weekend, great music, exciting art and crafts, and delicious food, and you have a reason to be extremely pleased about the fact that The Texas Crab Festival is alive and well. In fact, it is more than just well. It is thriving and on tap to celebrate 30 exciting and fun-filled years this May. 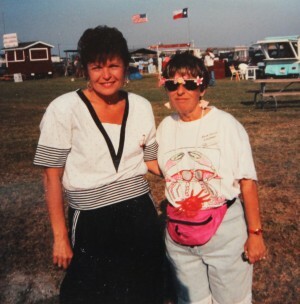 Janet Leigh Davis and Anne Willis at one of the early Texas Crab Festivals. The Festival has come a long way since the early days. Anne said that some of the local business people and members of the Crystal Beach Tourist Association were sitting around talking and it was decided that the Peninsula folks should band together to have an event calling attention to the beautiful beach area, the good food, local entertainment, artists, and the good life enjoyed by the residents. “We were thinking that we all went to Port Arthur for the big shrimp festival and Mardi Gras each year, and Beaumont had events, but the Bolivar Peninsula really had not planned anything like that. What did we have that no one else in Texas had or at least, promoted exclusively?” She said she honestly did not know who came up with the idea of crabs, but that because so many of the maritime folks crabbed and shrimped for a living, along with fishing, they decided to feature crabs. And so, the Texas Crab Festival was born in 1986. Anne added that you really could not expect to plan and host a good festival of any kind without great food and entertainment to keep the people coming year after year. “Oh, my goodness, and the volunteers that make it all happen. We would not have a Crab Festival without the countless hours of work put into the event each year. It takes all hands on deck,” she said sincerely. This reporter spoke with Moody Fredenburg, son of the original founder of M & M Concessions, and asked about the early days of the Texas Crab Festival. 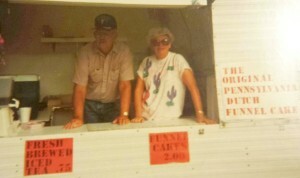 “My dad and mom had a good concessions business and they loved coming to the Texas Crab Fest. In fact, we always planned to come a few days early or stay a few days later to fish and just enjoy the beaches,” said Fredenburg. “I don’t know exactly when Dad and Mom started coming, but I know it was early. It may have been the first one, and they came down from Liberty for a dozen years or so. My wife, Marsha, and I took it up when they slowed down and we operated the concessions for seven or eight years.” The current Fredenburgs loved the Peninsula so much that after Moody retired from Amoco Chemicals, they retired to the beach where they currently live. Fredenburg says there are really no words to describe the Festival. “You really just have to experience it,” he says with some contemplation. “It is like a big family reunion with folks seeing people they have known for years, but have not had the chance to visit with in a while. The food is always good and man, oh, man, the entertainment. Some of the best musicians in Texas have graced that stage.” Fredenburg added that his mom always looked forward to Joe Faggard, a local legend, going about the grounds on Mother’s Day morning giving out pretty carnations to all of the women. Many mentioned Mr. Faggard and his love of the Texas Crab Festival. It was one of his duties to raise the flag at the opening ceremony and he did that until the year of his death. 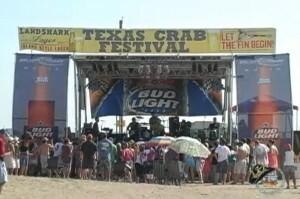 Many entertainers that have graced the stage at the Texas Crab Festival, some going on to national prominence. The Texas Crab Fest is held in Gregory Park where they have added a very nice covered pavilion, which makes a good dance floor, and adequate parking is provided. The beach offers its own draw and the event is one that is cherished by many. The many contests continue to draw participants and the entertainment is always good. The Crab Leg Contest is a favorite of many. There is a Texas 2-Step Dance Contest, the National Weiner Dog Races, a 5K Run and 1K Walk, the washers tournament, and the Charity Crab Gumbo Cook-off, among others. And, then there is the food — What’s not to like about choice treats featuring crab, shrimp, and fish, along with many other delicacies that the vendors provide? The Texas Crab Festival was named one of the nation’s 10-Best Food Festivals to Dive Into and was featured in a recent telecast with Anthony Anderson. “They prepared crab all kinds of ways. There was crab guacamole, and garlic, butter, and crab meatballs wrapped in bacon, and a crab pie, and that’s not even mentioning the gumbo,” wrote Anderson. “We’ve lost many of our regulars over the years,” said Anne with a hint of nostalgia. “Joe Faggard has died, Monte Potter with illness, and Sam Brown was killed in a fire, and I miss them. It seems that we always have good people stepping up to the plate and volunteering and I am so thankful for that. The Texas Crab Festival is the first thing some people come to Bolivar for, but it sure isn’t the last. They just keep coming back year after year and we are grateful for that.” Anne had to complete the interview to go check out one of her new crab decorated hats for the big 30th Annual Texas Crab Festival. Brenda Cannon Henley speaking with Jim “King of the Road” at the xxxx Texas Crab Festival.